We’ve all been there. The big marketing campaign you spent months on just ended, it was a smashing success! Champagne was popped, there were pats on the back all around, life was good. But when the dust finally settles, you’re left staring a mountain of data square in there eyes, wondering if the marketing attribution you set up tells the real story. 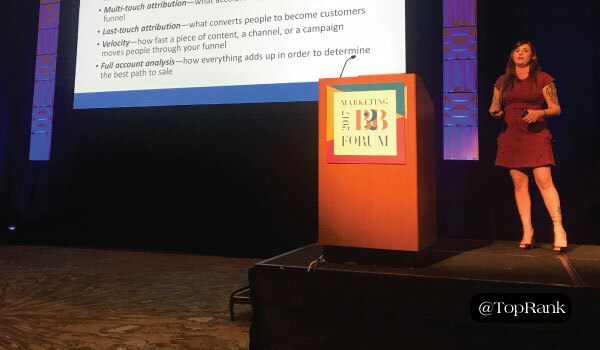 Fortunately for you, during this year’s MarketingProfs B2B Marketing Forum, Dayna Rothman of BrightFunnel broke down how you as a savvy marketer can orchestrate the buyer journey and turn it into a science by properly leveraging data and analytics. The “Marketing Holy Grail” is to turn the buyer journey into a science by sending the right message, to the right person, at the right time. In any well-rounded buyer journey, Dayna explained, there are several marketing touch points that the buyer will likely come in contact with. However, in most cases we track the sale or lead back to just a single touch point, such as a click from an offer email. But this doesn’t generally tell the whole story of the typical buyer journey. In most buyer journeys there are several touch points that contributed to the sale or conversion. Because of this, it is crucial that you are tracking all touch points in the buyer journey and not just one element. Doing this will allow you to truly orchestrate the buyer journey. By accurately tracking the above elements, you will be armed with the data that will allow you to begin to orchestrate an optimized buyer journey. Look for trends in how fast campaigns move the buyer through the funnel, the order in which content is downloaded, which channels and campaigns are most effective in each level of the funnel and even how sales activity integrates into the overall buyer journey. It is important to note here that although elements like first touch and last touch attribution can be relatively easy to identify in programs like Google Analytics and AdWords, professional marketing attribution software, if used properly will make full attribution tracking a much more manageable task. Benchmark your current program performance and buyer journey so that you can effectively measure success. Set a series of goals that align to your business objectives. Make sure that your technology stack can account for your attribution needs. Ensure that your tools are syncing properly. Become a change agent within your marketing team. Constantly keep testing and optimizing for success! Have you cracked the code on marketing attribution for your organization? If so, how did that change your approach? Disclosure: BrightFunnel is a TopRank Marketing client. The post Learn How to Connect Actions to Results Using Marketing Attribution appeared first on Online Marketing Blog – TopRank®.